Figure 1: Ecologic® 825 is een probioticum met meerdere species dat in de darm op meerdere niveaus actief is. Inflammatory Bowel Disease (IBD) is the umbrella name for ulcerative colitis, pouchitis and Crohn’s disease. All three diseases in the IBD group are characterized by flare-ups and remission. IBD affects over 1.2 million people in the USA and 2.2 million in Europe (2004)1. These numbers are expected to show an absolute growth of 7% between 2005-20252. Probiotics can be used to induce and prolong remission time (figure 2). The intestinal mucosal barrier has evolved to maintain a delicate balance between absorbing essential nutrients while preventing the entry to harmful contents. Disruption of this barrier has been implicated as an important pathogenic fac- tor in IBD, which results in an overactive immune system, thus leading to mucosal inflammation3. Several studies have been conducted to measure the effects of probiotics on IBD patients. 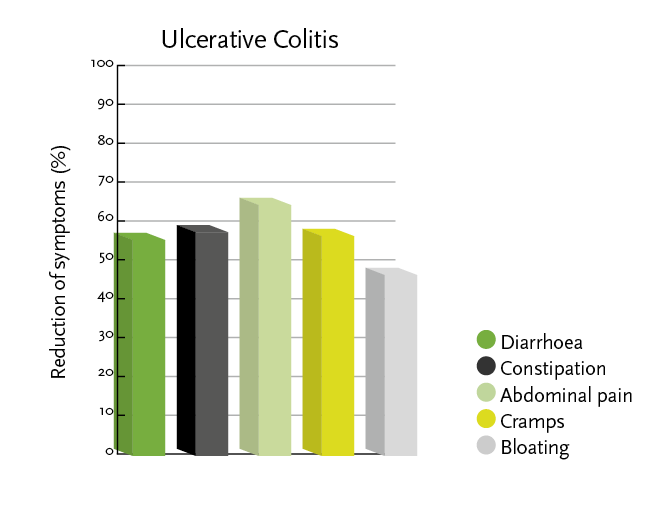 Overall, probiotics seem to have most effect on patients with ulcerative colitis or pouchitis. The effects of probiotics were shown to be highly dependent on the type of bacterial strains used4. Research has shown that probiotics have strain-specific effects and that multispecies probiotics are more effective than mono-strain probiotics5. For each application of probiotics, the right combination of strains must be selected. Figure 2: IBD is characterised by periods of inflammation (flare-up) and no inflammation (remission). Ecologic® 825 is used to prolong the remission time in IBD patients. Several in vitro studies and animal models have shown the effect of Ecologic® 825 in improving the barrier function6 7. In a randomized double-blind placebo- controlled trial the effects of Ecologic® 825 were studied in pouchitis patients. The results show that supplementation with Ecologic® 825 restored the increased gut permeability in patients with chronic pouchitis8. Another clinical study in overweight subjects showed that 8 weeks of supplementation of Ecologic® 825 decreases markers of gut perme- ability (zonulin, alpha-1-antitrypin and hsCRP) and thereby positively influences the epithelial barrier function of those patients9. In addition, Ecologic® 825 has been tested in an open pilot study with 60 patients suffering from ulcerative colitis and Crohn’s disease. Patients used the product for two months and were asked to fill in a questionnaire. This pilot study showed that Ecologic® 825 has a beneficial effect on patients with IBD. This effect is seen in UC patients where 77% experienced benefit from the usage of Ecologic® 825. In addition 59% of CD patients felt better after using it for 2 months10 (figure 3). Furthermore, Ecologic® 825 has been tested in an open label study with 14 patients with health problems related to intestinal barrier dysfunction. This study showed that Ecologic® 825 improves parameters of barrier function. Figuur 3 a: Effects of Ecologic® 825 after two months of usage in patients with ulcerative colitis, using questionnaires or ‘self-reported’. 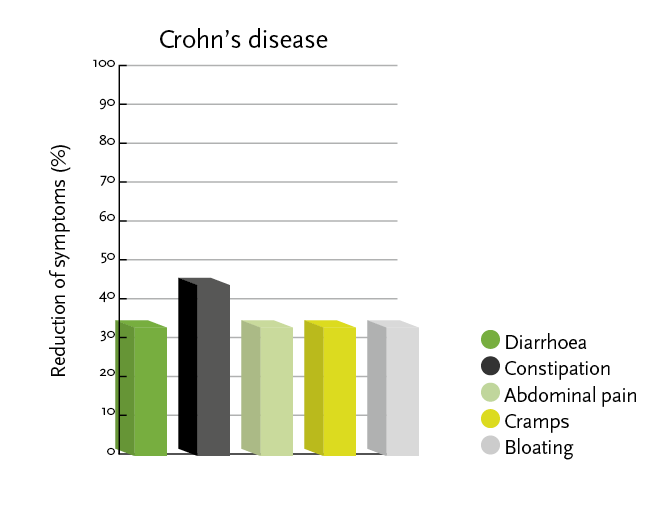 Figure 3 b: Effects of Ecologic® 825 after two months of usage in patients with Crohn’s disease. Lutgendorff F. et al. Defending the barrier. Effects of probiotics on endogenous defense mechanisms. Chapter 9: Role of mast cells and PPAR-: Effects of probiotics on chronic stress-induced intestinal permeability in rats Linköping University and University Medical Centre; 2009. Lutgendorff F. et al. Defending the barrier. Effects of probiotics on endogenous defense mechanisms. Chapter 10: Probiotics modulate mast cell degranulation and reduce stress-induced barrier dysfunction in vitro University of Utrecht; 2009. Persborn M. et al. The effects of probiotics on barrier function and mucosal pouch microbiota during maintenance treatment for severe pouchitis in patients with ulcerative colitis. Aliment Pharmacol Ther 2013;38:772-83. Hemert Sv. et al. Clinical Studies Evaluating Effects of Probiotics on Parameters of Intestinal Barrier Function. Adv in Microbiol 2013;3:212-21. Mulder L. Ecologic® 825 - A multispecies probiotic food supplement for IBD. Nutrafoods 2008;7(2/3). 1. Loftus et al. Clinical epidemiology of inflammatory bowel disease: incidence, prevalence, and environmental influences. Gastroenterology. 2004:26(6);1504-1517. 2. Gegevens van het Rijksinstituut voor Volksgezondheid en Milieu (RIVM). 3. Salim S.Y. 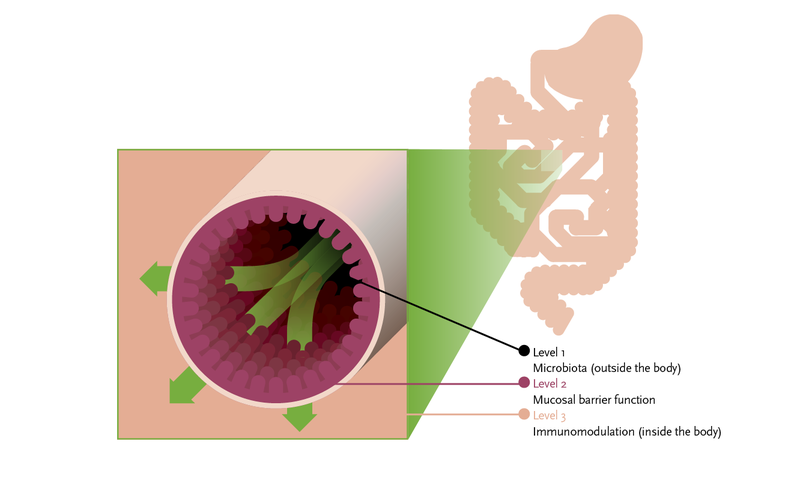 Importance of Disrupted intestinal barrier in inflammatory bowel diseases. Inflamm Bowel Dis 2011;17:362-381. 4. Shanahan F. Probiotics in inflammatory bowel disease - therapeutic rationale and role. Adv Drug Delivery Reviews 2004;56: 809–818. 5. Timmerman H.M. et al. Monostrain, multistrain and multispecies probiotics — A comparison of functionality and efficacy. Int J Food Microbiol. 004;96(3):219-233. 6. Lutgendorff F. et al. Defending the barrier. Effects of probiotics on endogenous defense mechanisms. Hst. 9: Role of mast cells and PPAR-γ: Effects of probiotics on chronic stress-induced intestinal permeability in rats Linköping University and University Medical Centre; 2009. 7. Lutgendorff F. et al. Defending the barrier. Effects of probiotics on endogenous defense mechanisms. Hst. 10: Probiotics modulate mast cell degranulation and reduce stress-induced barrier dysfunction in vitro University of Utrecht; 2009. 8. Persborn M. et al. The effects of probiotics on barrier function and mucosal pouch microbiota during maintenance treatment for severe pouchitis in patients with ulcerative colitis. Aliment Pharmacol Ther 2013;38:772-83. 9. Hemert Sv. et al. Clinical Studies Evaluating Effects of Probiotics on Parameters of Intestinal Barrier Function. Adv in Microbiol 2013;3:212-21. 10. Mulder L. Ecologic® 825 - A multispecies probiotic food supplement for IBD. Nutrafoods 2008;7(2/3).